A woman carrying a bundle on her head waits in line to cross the border into Colombia through the Simon Bolivar International Bridge in San Antonio del Tachira, Venezuela. An estimated 25,000 Venezuelans trek across the international bridge into Colombia each day. Many come for a few hours to work or trade goods on the black market. But increasingly, they are coming to eat in one of a half-dozen facilities offering the increasingly hungry Venezuelans a free plate of food. CUCUTA, Colombia — Under a scorching sun just a short walk from Colombia’s border with Venezuela, hundreds of hungry men, women and children line up for bowls of chicken and rice — the first full meal some have eaten in days. As Venezuela’s economy verges on collapse and its political upheaval worsens, cities like Cucuta along Colombia’s porous, 1,370-mile (2,200-kilometer) border with Venezuela have become firsthand witnesses to the neighboring South American nation’s escalating humanitarian crisis. 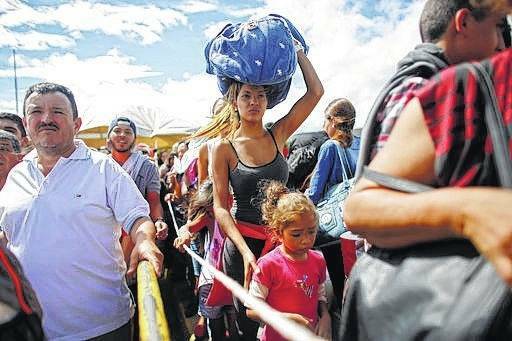 The Colombian government has crafted contingency plans in the event of a sudden, mass exodus, but already church groups and nonprofit organizations are stepping in, moved by images of mothers carrying starving babies and skinny men trying to make a few bucks on Cucuta’s streets to bring back home. “Those of us here on the border are seeing their pain,” she said. In the years when Venezuela’s oil industry was booming and Colombia entangled in a half-century armed conflict, an estimated 4 million Colombians migrated to Venezuela. Many started coming back as Venezuela’s economy began to implode and after Maduro closed the border in 2015 and expelled 20,000 Colombians overnight. Oropeza said he earned about $70 a month working at the Ministry of Education and selling hamburgers on the side — twice Venezuela’s minimum wage but still not enough to feed a family of four. Once a month his family receives a bundle of food provided by the government, but it only lasts a week. “So the other three weeks, like most Venezuelans, we have to make magic happen,” he said on a recent afternoon. He goes straight to the “Casa de Paso,” a church-run shelter that has served 60,000 meals to Venezuelans since opening two months ago. On an average day, 2,000 Venezuelans line up for meals, getting a ticket to reserve their spot and then waiting four hours for a meal served at outdoor plastic tables. When he’s not helping out or waiting in line at the shelter kitchen, Oropeza sells malted soft drinks for about 50 cents each. He’s been able to bring money back to his family and has earned enough to buy a cellphone, which he’d lacked for two years. AP Writer Christine Armario contributed to this report from Bogota, Colombia.